First of all, I want to thank each and every one of you for being loyal subscribers. 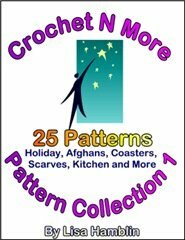 Some of you have been with us since the launch of the Crochetnmore website and newsletter. 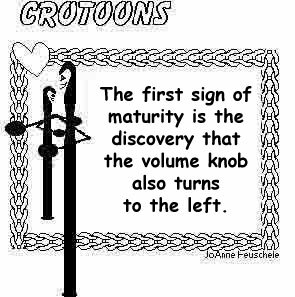 Believe it or not... Crochetnmore has been online serving the crochet community for almost 14 years. Whether you have been with us from the beginning or have just joined us, we hope you enjoy what we have to offer. Second, in the near future I will be offering crochet courses online... keep watching our homepage for information about how to sign up. Third, I have found that people who use the Firefox browser have had issues when trying to print our patterns. If you have this problem you can try printing using Internet Explorer OR copy the pattern and paste it into a word document and print it from there. Last, I apologize for this issue being a little later than normal. I had to turn off my computer due to thunderstorms. there is an opportunity for kindness." With what shall I come to the Lord and bow myself before the God on high? Shall I come to Him with burnt offerings, with yearling calves? Does the Lord take delight in thousands of rams, in ten thousand rivers of oil? Shall I present my first-born for my rebellious acts, the fruit of my body for the sin of my soul? He has told you, O man, what is good; and what does the Lord require of you but to do justice, to love kindness, and to walk humbly with your God? The voice of the Lord will call to the city -- and it is sound wisdom to fear Thy name: Hear, O tribe. Who has appointed its time? OF SALVATION BUT THE RESULT ." to what should you devote yourself? and draw through the stitch and the loop on your hook. to one of those found in the variegated yarn and use it to complete those last few stitches. "Stupid question I guess, but somewhere along the line I've gotten completely confused between a slip stitch and a single crochet. Please help??" To make a slip stitch you insert the hook into the stitch, yarn over and pull the loop through the stitch AND the loop on the hook. To make a single crochet insert the hook into the stitch, yarn over and pull the loop through the stitch then yarn over again and pull through the two loops on the hook. Hi, Can you tell be how to the fpdc stitch? I was checking out your website an clicked on the loaf pan carrier pattern and a coaster pattern comes up instead. Just thought you might want to check on it. a few others I found that were incorrect on that page. The video is playing fine for me. Please make it easier to find the new patterns; one must go through a whole unnecessary windows. is linked on the left side on nearly every page. would like to browse through. the newsletter until you get to that section. @Crochetnmore I love your website and your tweets. Keep them coming! Will you be doing a video where join granny squares? thats a problem I encounter many times. Thanks for the videos. I have added several new videos on how to join squares. I have used this several times already and it kept my yarn from escaping while my husband was in the hospital. Thanks! I think I can do this now. Thank you! Now I will not feel so bad when I "gut" almost a whole skein to find the center pull strand. Wonder why manufacturers don't make it easier for us? Redheart is the only brand I never have trouble finding the center on but I hate working with their scratchy yarn. @arily83 You're very welcome. 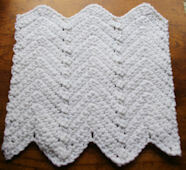 I used Bernat Baby Coordinates yarn which I refer to as sport weight baby yarn. The label says it's "light Size 3". I used﻿ a Hook Size H.
This hat is newborn size. Thanks for the video! I have had troubles in the past with my yarn. I try to locate a strand before I even buy the yarn. And I love "I Love This Yarn" found at Hobby Lobby! I am looking for an afghan pattern that resembles cats "sitting" on top of one another. I believe they are done in a shell type stitch for the cat head and body, the tail is extended down from the body of the cat into/"beside" the cat below. The ears were even pointy like a cat's! If I remember correctly, the tail of the upper cat does not extend past the "head" shell of the cat below. The pattern was done in three colors with one complete cat (including tail) in each color. I've misplaced the pattern and contacting places like Annies Attic, Leisure Arts etc...have had zero results. It was in a book with several other patterns. 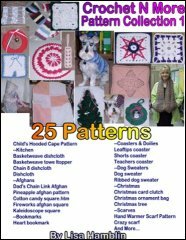 I wondered if you or any of your readers would have a copy of the pattern I would really appreciate it. If they want to contact me, please have them put cat afghan pattern in the subject line so I know it isn't spam. Could this be the pattern? I haven’t seen one that had the tails of the cats in it. It's very close to what I remember! You are my new best friend! :-p The pattern does show the "tail" it's the little extended stitch to the right of the "cats"
I seem to remember the cats' bottoms being a bit fatter but with this pattern I can play and adjust. I would love to make your beautiful hankie for the mother-of-bride, who is my best friend, and would like to know what the measurments are. The picture shows a triangle shape, so I don't know if you folded the hankie into this shape for the picture, or if it is crocheted in this shape. Please let me know today if you can, as I would like to order the #10 thread. The hankie is square... I folded it for the photo. the hankie would measure around 10-12 inches square. Thank you for helping with joining the granny squares...I used your single crochet method. Not done yet though...waiting for more mohair from the mailman! It is good to be in contact with other crocheters,I have enjoyed the art of crochet for 30 years,have plenty of experience,and am still finding new ideas,and learning. Foundation chain always too tight? Make it using a larger hook size then go back to the smaller hook. I like that idea. I'll have to remember that. Crochet Tip: If you have long hair, pull it back before you start crocheting to keep hair out of your work. I have short hair and LOL I never thought about that.. That could be an interesting situation.. I've had to frog many a stitch because of hair ending up in my work. Me too, annoying isn't it?? I have long hair and have had thus problem no have I heard if anyone else having suffering from this problem. Do you have a copy of the written instructions that I can print out? The link to the pattern page is listed below the video. Sorry, YouTube doesn't let me put links to webpages in the comments. You can also find﻿ the pattern by searching for "crochetnmore baby beanie". How the heck to I do this? I don’t understand the sp…. I looked up the definition, however I’m still lost. BTW I’m a total beginner. The attended at the store said to start with dishcloth and these instruction are in the dishcloth….. AAAAAHHGGGGGGG! When a pattern instructs you to﻿ work into a space (sp) you work into the hole beneath a series of one or more chains instead of into the chain stitches themselves. I have a video on youtube explaining chain spaces... sorry but youtube doesn't allow me to post links here. You can find it on the crochetnmore youtube channel. What a great video! I get your newsletter in my email and learned about this stitch through that. I had never heard of this stitch before, i'm a fairly new crocheter, but i'm always glad to learn﻿ a new stitch. 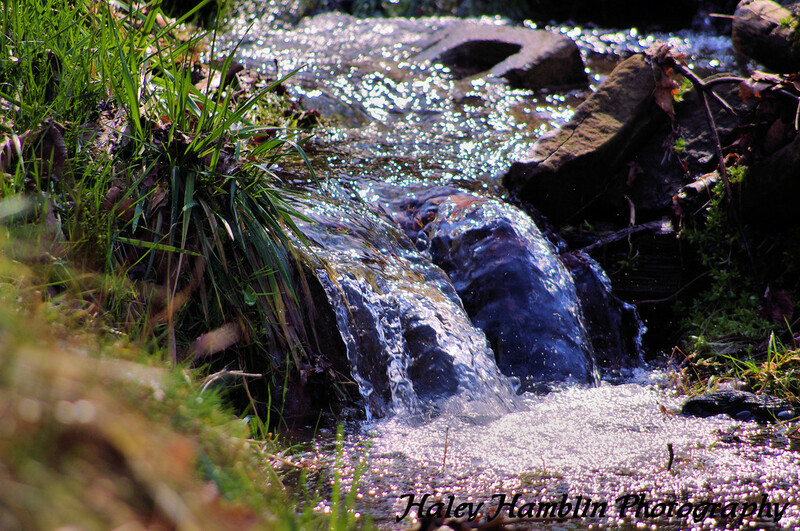 :-) Thank you Lisa for your great website, newsletter and now your videos, you've been a great help to me. Where is your favorite place to crochet? according to their common characteristics. all the items have holes in the center. "All of those things contain too much cholesterol." I was about to leave the house on an errand, and my husband was getting ready for a dental appointment. "I wish we could trade places," I said, knowing how much he dreaded the coming ordeal. My husband shook his head. "No, thanks," he said. "At least where I'm going they give you anesthesia." Johnny: I've already got one rabbit at home now! My job as a land surveyor took me to a golf course that was expanding from 9 holes to 18 holes. Using a machete to clear thick brush in an area I was mapping, I came upon a golf club that an irate player must have tossed away. It was in good condition, so I picked it up and continued on. At a family picnic, my aunt was admonishing her six-year-old son to wash his hands before eating. He protested that they weren't dirty, though after a few minutes of complaining, the boy finally did go and wash them. day, he phoned the classifieds department to complain. One day at the veterinarian's office where I take my cat, a man and the receptionist were verbally sparring. After a few moments a technician came to her co-worker's defense. the conditions we might run into, we drove on. Forest road when we saw a sign: "Ice 10 miles." Five miles farther on, there was another sign: "Ice 5 miles." The next one was, "Ice 1/2 mile." We practically crept that half-mile. and it read, "Ice 75 cents." Our nephew was getting married to a doctor's daughter. At the wedding reception, the father of the bride stood to read his toast, which he had scribbled on a prescription pad.